When I went on my big shopping excursion last week (which I have decided to call The Week of the Purple Cords), I was surprised that my favorite store didn’t have what I was looking for. I will call this store Merlins, because I am not a paid endorser. (Although I could be… So if you own the store where I spend 93% of my discretionary income, please give me a call.) The other 7% is spent on chocolate. I went into Merlins looking for corduroy jeans. I like boot-cut jeans. I think they balance my hips nicely and make my legs look long. And I like them a little long, so I can wear a high-heeled boot, and make my legs a couple of inches longer still. But Merlins had only slim leg jeans. No boot-cut. I was very surprised. I am overly proud of my fashion sense. I am rather obnoxious in the way I think I have better taste than anyone. And my devotion to Merlins is part of my vanity. This store had undergone an image change over the past several years, and had moved (in my perfect opinion) from dowdy to stylish. And about six months ago I found myself eavesdropping on a conversation between two men with controlling interests in the retail business. They were discussing the possible sale of Merlins. “You can buy it now for a bargain,” said one wheeler-dealer. “They’ve tried to update their image, but their customers are old ladies, and so they have alienated their base.” I laughed to myself, because I am one old lady who loves Merlins now that they have stylish clothes. So no boot-cut? I was disappointed, and I went to my second favorite store, Caspers (…and, yes, your name could be here for a few bucks…) and bought my three new pairs of boot-cut cords. Including purple. Okay, not really me. But a nice way to illustrate with a thinner younger me. I went to New York City this week. I used to go into the city all the time, but now I’m lucky if I get there once a year. The best part of New York is fashion watching. I love to see what everyone is wearing. Everyone was wearing straight leg jeans tucked into boots! And flat boots too, when I had just bought high-heeled boots! Uncomfortable high-heeled boots. 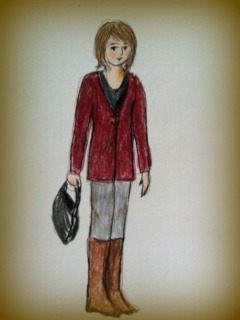 What I could look like, if I lived in New York. And if I were thinner and younger. My husband always says that we live in East Bumf**k. I thought I was fashionista. But I’m a bumpkin from Bumf**k.
Now I know why Merlins only had straight leg cords. Because they are in style! Now I have to go shopping again. Yeah, any reason to go shopping again! I love your illustrations! And you are so lucky to have a Merlins near you. I thought they’d gone out of business because their stores in Michigan were shut down. We lost the one in town, so I have to drive about twenty miles. I never feel in style when I go to NYC. I have my own comfortable style and try to stay happy with it. Great drawings. This is how I felt when boot cut became popular! They reminded me of my days in junior high (and NO ONE wants to be reminded of junior high). I did not buy or wear jeans from around 2000 until 2007 when straight leg jeans came back into style. When I first saw straight jeans in 2007, I bought 10 pairs because I was so afraid they would disappear again! I’ve never taken the time to analyze which style looked better on me, maybe I should take a longer look in the mirror. I prefer slender leg pants-just seems that a wider anything would only exaggerate my wide parts! Well, I’m out of style (which should come as no surprise to anyone), because I love boot cut jeans. I agree with you about making my legs look longer. I don’t think the straight legs tucked into boots is gonna do anything to make my 5’4″ (if I stand up straight) look tall. And, by the way, my hubby also uses Bumf**k (occasionally), but his reference is Bumf**k, Egypt. I have no idea why. I’m been thinking for a while now that you and I are married to the SAME GUY! I’ll have to stick with the boot cut and hope my out-of-style pants last until they are in style again. The straight legs, when extending from a wide-hip size, give me the never envied ice-cream-cone look, which when added to flat boots would probably not accentuate the positive. I LOVE boot cut jeans and now that I think of it, I haven’t seen any in at least 5 years. You are so right: Bummer. Well when I discovered a perfect fit cord pant last year I ordered various colours too but my big faux paux was getting a pair of red ones. What was I thinking? I look like an awkward Santa Claus in them. Alas I have never worn them outside my bedroom. I only wish I had gone with purple. At least they would have matched my veins in my lovely legs! Anyway you have me going nuts now wondering what Merlins really is! As for Bumf—I know that place well. Lol. We actually refer to it as Bumblef—! I live in a place that is, oh, 20 popular culture years behind the rest of the world (except for, perhaps, where you live). We are in the bell-bottom/tube-top revival stage at the moment. I can’t go shopping for another 10 years or so. And I just complained to a store where I bought clothes that they only had boot cut pants. They had no other choices. I think we need to wear what looks good on our bodies, rather than what is in style. Why can’t the stores just keep a little variety so we have as many choices as there are body types? I could never wear purple cords….even when young. So you should be proud! I couldn’t even begin to tell you the style of pants I wear. I can say “pants” but that’s the extent of my fashion knowledge. I know they go on my legs, which I guess is a good thing to know. I think with your purple cords, lavender cami, pale green sweater and heels you could be a fashion setter… well… maybe for ladies of a certain age at any rate. Your illustrations are so great! I wish I could draw like that. I can’t believe they are wearing the straight leg tucked in boots look in New York! Because they are wearing them in San Antonio right now, and we are always at least two years behind the rest of the fashion world. Could it be possible that San Antonio’s straight leg are from a dozen years ago, and now it’s come back in New York, while San Antonia is still on the first go-round? Very likely. People wear Ugg boots with short shorts here, so we’re not exactly on the cutting edge. Lucky for me – I have a 22 year old daughter who keeps me informed as to the ‘correct’ fashion. Otherwise – me too – I’d be living in Bumf*k! Enjoy your purple cords! I am a proud supporter of the boot cut. There is far too much junk in my trunk to wear a slim legged pant, regardless of what the stylish people of the world are doing. Those high-heeled boots, though could go either way. I say wear what makes you look and feel good, even if it is purple. 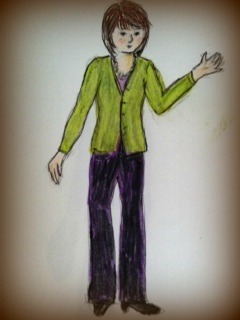 If you are rebellious enough to wear purple pants, I don’t think it matters whether they are straight, skinny or boot. Really enjoy your storytelling style. And I’m with you on the boot cut. They balance out the saddle bags that some of us carry around. I’m in the “wear what looks good on me regardless of style” camp. Straight leg jeans look horrible on me. And the boot tuck thing? Must be a throw-back to the late 70’s/early 80’s because I remember dressing like that back then. I live in Indiana, not exactly the hot spot for fashion. But I watch What Not to Wear faithfully because I think they give good advice that applies to whatever age you are. It’s pretty much what some other commenters have said “Wear what looks good on YOU!” I always think of them when I wear my boot cut dark blue or black jeans with high heel boots. They really DO make me look taller and slimmer. They also are big advocates of fitted jackets. Also of having clothes altered if necessary. I feel like, while still not a fashion plate, I do dress better from watching their show. Ha! I still think boot cut is one of the most flattering styles around, ‘in’ or no. And I need to wear heels because it makes me look 20 lbs. thinner. Scientific fact. But jewel tone purple ( skinny and tucked in boots) is acceptable according to some fashion pages- but not in ribbed cord – must be plush not ribbed…it’s just tooo complicated!